I really love pancakes. Fluffy pillows of grainy goodness. I can eat them any time of the day. As a special treat my mom used to make pancakes sometimes on the weekends. When I was old enough to cook for myself I helped make them also. I really love passing on a love of food to the kids. Food is such a great social binder and nourishes the soul as well as the body. Corny I know but it really is all that and more. On that note, my ingredients have changed a little bit since my early cooking days. I am on a mission lately to add more whole grains and take out the refined sugar. 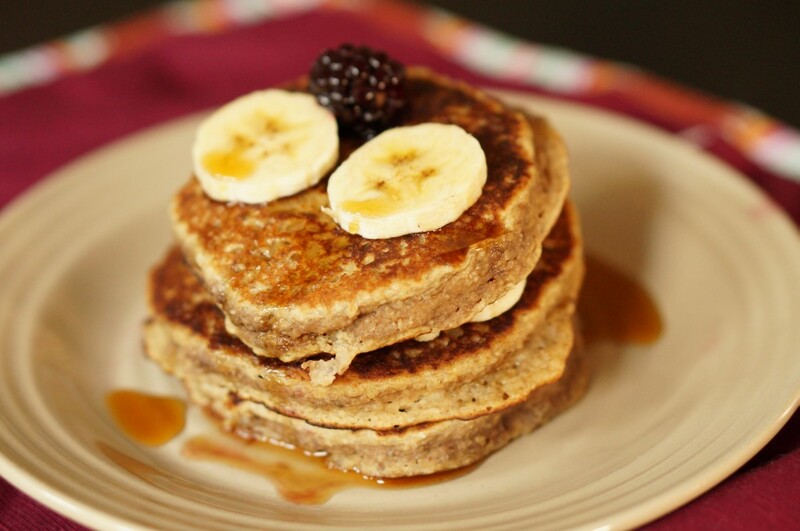 So here is my version of whole grain pancakes sweetened with pureed apples and bananas. Sort of smoothie meets whole grains. Feel free to substitute any grains you have on hand. I used ground oats and white whole wheat flour. Grind the oats, sunflower seeds and chia in a food processor or blender. Add the white whole wheat flour, baking powder and salt. Stir to combine. Puree the almond hemp milk, apple slices, banana. apple cider vinegar and vanilla in a blender. Add wet ingredients to dry and mix to combine. Add quarter cups of the batter to a cast iron skillet coated with oil. Fry a few minutes on one side. Flip and fry until both sides are golden brown and the center is done. Layer the pancakes with banana slices and blackberries. Top with maple syrup or my favorite, apple sauce. Enjoy.